Communication satellites have been in use for over 50 years to deliver all sorts of traffic, data voice, video, you name it. 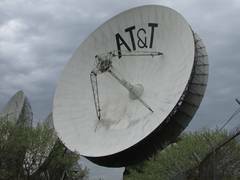 One of the first commercial links was AT&T's Telstar, primitive by today's standards, but it helped set the direction of future satellite links. But how do they work? There are thousands of satellites in various different types of orbit providing every imaginable service from satellite TV, telephony, data relay, meteorology, imaging, etc... There are three main types of orbit. Low-Earth orbit is only 390 km (240 mi) above the Earth's surface. Most of the satellites in this orbit are scientific missions like meteorological observatories and other surveys, as well as space stations like the ISS and instruments like the Hubbell space telescope. The space shuttle was designed for low-Earth orbit. Medium Earth orbit occupies the 1,000 km (600 mi) and up area, and is home to many short coverage communication satellites like the Iridium digital phone system, as well as some more imaging and weather satellites, a few experiments, and dozens of other applications. Medium Earth orbit is the most populated orbital region with thousands of active satellites. The kind of satellite that you're likely most familiar with is the geosynchronous satellite. These majority of these satellites occupy a region referred to as the Clarke belt (after Arthur C. Clarke, who came up with the idea), which is a ring around the Earth's equator, 36,000 km (22,400 mi) above the surface. Satellites in the Clarke belt orbit once every 24 hours, and since they're orbiting the same direction as the Earth and on the same axis, they appear to stand still at a set point in the sky, which allows them to be received with high gain, highly directional (narrow beam width), fixed antennas such as your satellite dish. The general term for these satellites is geostationary, or fixed satellite services (FSS). There are less than two hundred satellites in geostationary orbit, and they're not permitted to orbit within 2° of one another. All TV broadcast satellites are geostationary. The advantage of this type of satellite is that it can cover a very wide area, like an entire country or even an entire hemisphere using very little transmitter power. There are other satellites in geosynchronous orbit that do not orbit over the equator, so all geostationary satellites are geosynchronous, but not all geosynchronous satellites are geostationary. One example of this would be the tundra orbit. Above 76° latitude, satellite reception is all but impossible, since most geostationary satellites are below the horizon. A tundra orbit is a highly inclined orbit that traces a lopsided figure eight on the ground, and spends most of its time above a Northern latitude. A disadvantage is that it requires either a tracking antenna or a fixed antenna with a wide beam width. One example you might be familiar with is the satellites used for Sirius Radio, they use a tundra orbit to achieve a high elevation angle over the continental US and Canada, broadcasting a very powerful S band signal that can be received by small patch antennas with a 90° beam width. There are three parts to the average satellite, the power system, the bus, and the communications payload. In the industry, the satellite is referred to as the space segment. The power system usually consists of two folded solar cell arrays which are extended once the satellite is in orbit. The arrays have to provide all of the power for the satellite's normal operation, about 20 kW, with enough extra capacity to charge a set of batteries to run the satellite when it's in the Earth's shadow. The batteries used may be common nickel cadmium (NiCd) batteries, like the ones used for power tools, but recent designs requiring more power are using more complicated and expensive high performance nickel hydrogen batteries, which consist of a pressure vessel with nickel electrodes and a gaseous electrolyte. The satellite bus, which is now based on a number of industry standard designs such as the Boeing BSS series, Lockheed Martin A2100, Space Systems Loral SSL-1300, and Alcatel Spacebus, contains all of the heat regulation, power systems, station keeping, and houses the communications payload. Heat is regulated inside the bus by things like heat pipes, motorized louvers, electrical heating elements, and mylar insulation. Telemetry, which is remote data about the position and health of the craft is also handled by the bus. Station keeping is the process of keeping the satellite in its orbit. Even at 36,000 km, in the exosphere, there are enough gas molecules to create drag on the spacecraft. Combined with gravitational disturbances this causes the satellite to periodically drift out of alignment. There are a few different methods of propulsion, but by far the most common is hydrazine monopropellant. The hydrazine is stored in a pressurized tank and jetted through nozzles to control the yaw and pitch of the spacecraft. 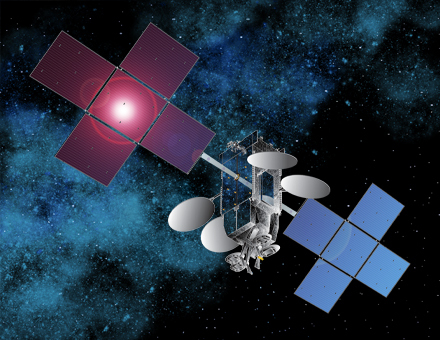 Most satellites carry enough hydrazine for 15 years of operation, after which the satellite will be retired and replaced. The communications payload is the part of the satellite that is responsible for receiving, amplifying, and re-transmitting a signal. Most satellites have 1 GHz of total bandwidth, per band. In the past, satellites were launched with either C or Ku band payloads, but these days most satellites include C and Ku transponders. C band satellite transmissions are from 3.7-4.2 GHz with linear polarization, Ku band transmissions are from 11.7-12.2 GHz with linear polarization. There is an extended Ku band from 12.2-12.7 GHz, but in the US this is restricted to high power direct to home satellite TV, and uses circular polarization. Now if you'll look at the numbers you'll realize that those figures only represent 500 MHz of bandwidth. The reason for this is frequency reuse. In each band, the satellite is divided into 24 separate channels, each 40 MHz wide. The frequency of each channel is used twice, but with different polarization. Polarization is the plane in which the electromagnetic portion of the wave is oscillating, determined by the physical position of the antenna. Changing the polarization of an antenna simply means rotating it 90°, for example, the aerial on a car is vertically polarized, while a TV antenna would be horizontally polarized. Satellite transmissions use one of two polarizations, horizontal and vertical, or H and V for short. The trick to getting 1 GHz of bandwidth out of 500 MHz of spectrum is to broadcast the odd numbered channels in one polarization and even in the other. The receiving antenna can easily reject the unwanted polarity while allowing the desired polarity through. The channels don't overlap exactly, the center frequency of the odd numbered channels are offset by 20 MHz from the even numbered channels. Each channel is handled by one transponder, and a channel is simply often referred to as a transponder. All of the even or odd transponders are received by the downlink antenna at the same time, but each channel will have its own carrier and operates independently. Physically, a transponder consists of four main parts: a receiving antenna, a frequency downconverter, an amplifier, and a transmitting antenna, although multiple transponders may share a receiving or transmitting antenna. The receiving antenna, a horn type, receives the signal from an earth station at a frequency higher than the downlink frequency. For C band this is 5 GHz, and for Ku band this is 15 GHz. The frequency downconverter shifts the signal to the final downlink frequency. It's then fed to a high powered amplifier. There are two main types of amplifiers: traveling wave tube amplifiers (TWTAs) based on vacuum tubes and solid state power amplifiers (SSPAs) based on transistors. The TWTA is more common, and more rugged in space operations, although you may find an SSPA used in some applications. The output power is usually in the range of 5 to 20 watts for C band and 50 to 75 watts for Ku band. Higher power is used for Ku band due to the increased atmospheric absorption in that band. You'll notice that these are really small power levels compared to terrestrial transmitters, considering that there are radio stations with 50,000 or more watts of transmitter power. There are two reasons for this, one being that for the most part, the satellite bus can't provide enough power to run a high wattage transmitter (and microwave transmitters are pretty inefficient to begin with), and two, since we're using microwaves with their short wavelengths, an antenna with extremely high gain doesn't need to be very big. The output of the power amp is fed into another horn antenna, which is aimed at a beam former: the white structure in the drawing above. The beam former can be manufactured to give a certain pattern, concentrating the signal over the satellite's home country, or can spread the beam wide enough to cover an entire hemisphere. Even more closely controlled beams can be formed with the use of spot beams, which can cover an area as small as a few hundred square miles, allowing its frequency to be used elsewhere. This is accomplished by using a highly directional transmitting horn. Some satellites even have programmable spot beams, where the horn antennas are connected to the transmitter via flexible waveguide and can be positioned remotely via an electric motor. Each satellite operator will have an uplink Earth station from which the satellites are controlled. There are a few main operators of satellite fleets today. Intelsat is the largest and owns the Galaxy and (formerly AT&T) Telstar satellites, SES Americom, formerly GE Americom, formerly RCA Satcom owns all of the AMC and SES satellites, Echostar, which owns the Echostar satellites, Telesat, which owns the Canadian satellites like the Anik and Nimiq satellites, and DirecTV, which owns the DirecTV satellites. Inside the uplink center you will find racks of equipment performing various functions. Some of the equipment will be for telemetry and control, but most of it will be communications related. A satellite can carry any type of data, with any type of encoding. That data and encoding is determined by the uplink. Here you will find the encoding equipment, which these days usually consists of a DVB modulator or modulator/demodulator (modem), which takes data from an external interface such as Ethernet, generates a carrier wave, and encodes and modulates the digital data onto the carrier along with some control information such as forward error correction, which is used on one way links to detect and fix errors in the received signal. Since all of this is digitally encoded, any type of data can be carried, sound, video, internet traffic, etc... There will be one modem for each carrier. Usually only one carrier is transmitted on each transponder but multiple carrier per channel (MCPC) transmissions are relatively common. MCPC reduces the total amount of data that can be carried, but is the only way to uplink to a single transponder from multiple locations. The outputs of the modems are combined and fed to the block upconverter to be converted to the uplink frequency, then on to the power amplifier and antenna. The most common modulation used today is Phase Shift Keying, where the phase of two carriers are changed in relation to each other to create a symbol. The total number of symbols determines how much data a link can carry. A typical transponder is capable of carrying up to about 30 million symbols per second reliably. The number of bits encoded by each symbol depends on the type of PSK used. Binary phase shift keying has two symbols and encodes only one bit per symbol, and is rarely used in TV broadcasting. Quad Phase Shift Keying (QPSK) is the most common modulation for digital TV signals, it has four symbols and carries two bits per symbol. Octal phase shift keying (8PSK) is becoming widely accepted to carry higher data rate HD video streams, it has a total of 8 symbols carrying three bits of information each. Downlink signal power can be measured three ways, carrier to noise ratio (C/N), energy per symbol over noise (Es/No), or energy per bit over noise (Eb/No), all of which are measured in decibels (dB). Decreasing the symbol rate or using a modulation with fewer total symbols increases Eb/No, decreasing symbol rate increases Es/No, and increasing the power of the carrier increases all three. Before digital transmission became available, analog transmission was used, and still is in a few cases as of this writing (2014). Analog video was transmitted via frequency modulation (FM), which differs significantly from the quadrature amplitude modulation that was used for analog over the air transmission. The video encoded by an analog satellite signal can be very clear, but has the disadvantage of being very spectrally inefficient. Each channel takes up an entire transponder, 40 MHz of bandwidth, limiting a satellite to carrying only 24 channels whereas with today's digital modulation a single transponder can carry more than 24 channels. Outside, each satellite will have one or more dedicated uplink antennas, which can be very, very large. The one pictured is 18.3 meters (60 feet), although 4-10 meters is more common. Uplink antennas are usually dual reflector types, and fall into two categories: Gregorian, which has a concave subreflector, and Cassegrain, which has a convex subreflector. The signal is piped through a horn antenna on a waveguide that exits the center of the dish, then bounces off of the subreflector to illuminate the surface of the dish. This type of antenna has four waveguide inputs: H TX, V TX, H RX, and V RX, to transmit and receive both polarities simultaneously. The reason these are so large is that to get the maximum downlink power, the uplink power has to be high enough to drive the satellite's transponders to saturation. Simply put, the stronger the uplink the signal, the stronger the downlink signal. The transmitters connected to these antennas can be located inside, and connected to the antenna via a long waveguide, or close to the antenna and connected to the modem, whose output is in the L band (950-2150 MHz), via a long coaxial cable. Both options have advantages and disadvantages. The amplifiers are the same general type as those used on the satellite, and fall into the same two categories: SSPAs and TWTAs. TWTAs are the most commonly used, but SSPAs represent a larger percentage of ground based transmitters than those in space. Carrier grade transmitters can operate at up to several hundred watts; the largest one I was able to find was 700 watts. Providing a stronger signal than what will be necessary to saturate the transponders is unnecessary, and won't result in any increased downlink power, but will wear out amplifiers more quickly, so uplink amplifiers are usually configured to automatically adjust power levels for the current weather conditions. The downlink is received simultaneously by the uplink antenna, and is measured by a control system that will increase transmitter power whenever the signal drops below a certain threshold. When broadcasting at these power levels it is critical to have a very narrow beam width, a larger dish will create a more compact, narrow beam than a smaller one, which keeps the transmissions from interfering with adjacent satellites. Which isn't to say that it's not possible to uplink with a smaller dish. VSAT stands for very small aperture transmission and refers to dishes under a couple of meters that are used for transmitting. The most common form of these are the small 1m and 75 cm VSAT antennas used to provide broadband internet to rural customers. Another example would be the small Ku band antennas mounted to satellite trucks and used by news services for event coverage, a concept called satellite news gathering (SNG). The major difference between these systems and a carrier grade uplink is that VSAT is restricted to low power levels, usually under 10 watts, and under 1 watt for the aforementioned broadband internet application. This results in a very low powered downlink, which requires a large antenna at the downlink site. For example, a Ku band signal transmitted by a 5 meter dish with adequate transmitter power to saturate the transponder will be receivable with a 75 cm antenna, while a signal transmitted by a 75 cm antenna at a few watts may require a 5 meter or even larger antenna to receive. See my photo essay of an old AT&T International Earth Station for more pictures of what a carrier grade uplink Earth station looks like. This is the Earth station for the end user, that receives the signal coming down from the satellite. There are two broad categories of Earth station, TVRO/direct to home and satellite master antenna TV (SMATV). In a direct to home system, the end user receives the signal directly from the programming provider via satellite. The purest form of this is the C band dish. In the US, all commercially available pay TV is uplinked by the originator (Discovery Networks, Turner Networks, etc...) and distributed on various C band satellites. DBS systems like Dish Network and DirecTV are also considered direct to home services, although they receive their programming via C band, before re-encoding it and uplinking it to their own satellites. The second category is SMATV, where the satellite signals are received by a headend where they are transcoded (usually to 256-QAM) and sent out over coaxial cable. This category includes cable TV and the master dish systems used by large apartment buildings and hotels. As with the uplink station, a highly directive high gain parabolic dish antenna is used. A 1 meter antenna has a gain of 40.6 dB at 12 GHz, which means that the incoming signal, equaling only a fraction of a billionth of a watt is amplified to 11,482 times its original level. At the focus of the dish is a horn antenna which selects the correct polarity, connected to a device called a low noise block-downconverter (LNB). The purpose of the LNB is to collect the signal and amplify it, then convert it from the downlink frequency to an intermediate frequency. It's called a block downconverter because it converts a 500 MHz wide block of frequencies, either all of the even or all of the odd transponders, all at once. The output is also 500 MHz wide, but has been converted to the L band, 950-1450 MHz . In the earliest days of satellite, the amplification and downconversion were performed by separate components: a low noise amplifier connected to the feedhorn with a waveguide, with the LNA connected to a block-downconverter via a short length of coaxial cable terminated with N connectors. The signal is converted to an intermediate frequency to make it easier to send over a coaxial cable, the higher the frequency, the higher the loss of signal per meter of coaxial cable. The low noise part of the name refers to the engineering practices and components required to design and build the LNB. Amplification creates noise, think about the hiss you hear when you turn a stereo all the way up. Each LNB is given a noise temperature in degrees Kelvin (°K) or noise figure (dB) which specifies how much noise it introduces into the system. The reason noise is such a big deal is because the signals being worked with are so small. Even after the dish has amplified the signal, it's still nowhere near strong enough to be useful, so the LNB amplifies it again, by up to 65 dB. This is a massive increase, the output is 3.16×106 times stronger than the input, so it's important to amplify the signal without amplifying the noise. Depending on what kind of Earth station it is, the signal will go on to one or more receivers, which contain circuitry to demodulate the intermediate frequency to extract the digital data. The receiver uses an algorithm to compare the known values in the error correction with what was received. If it doesn't match, the receiver uses a mathematical formula to calculate what the missing data would be, based on how the error correction codes were changed. Errors can happen frequently, but only un-correctable errors, where the signal has degraded to the point where the receiver can't calculate the missing data, are a problem.